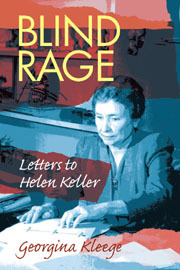 As a young blind girl, Georgina Kleege repeatedly heard the refrain, “Why can’t you be more like Helen Keller?” Kleege’s resentment culminates in her book Blind Rage: Letters to Helen Keller, an ingenious examination of the life of this renowned international figure using 21st-century sensibilities. Kleege’s absorption with Keller originated as an angry response to the ideal of a secular saint, which no real blind or deaf person could ever emulate. However, her investigation into the genuine person revealed that a much more complex set of characters and circumstances shaped Keller’s life. Blind Rage employs an adroit form of creative nonfiction to review the critical junctures in Keller’s life. The simple facts about Helen Keller are well-known: how Anne Sullivan taught her deaf-blind pupil to communicate and learn; her impressive career as a Radcliffe graduate and author; her countless public appearances in various venues, from cinema to vaudeville, to campaigns for the American Foundation for the Blind. But Kleege delves below the surface to question the perfection of this image. Through the device of her letters, she challenges Keller to reveal her actual emotions, the real nature of her long relationship with Sullivan, with Sullivan’s husband, and her brief engagement to Peter Fagan. Kleege’s imaginative dramatization, distinguished by her depiction of Keller’s command of abstract sensations, gradually shifts in perspective from anger to admiration. Blind Rage criticizes the Helen Keller myth for prolonging an unrealistic model for blind people, yet it appreciates the individual who found a practical way to live despite the restrictions of her myth. Georgina Kleege is a lecturer (SOE) in the Departemnt of English at the University of California, Berkeley.